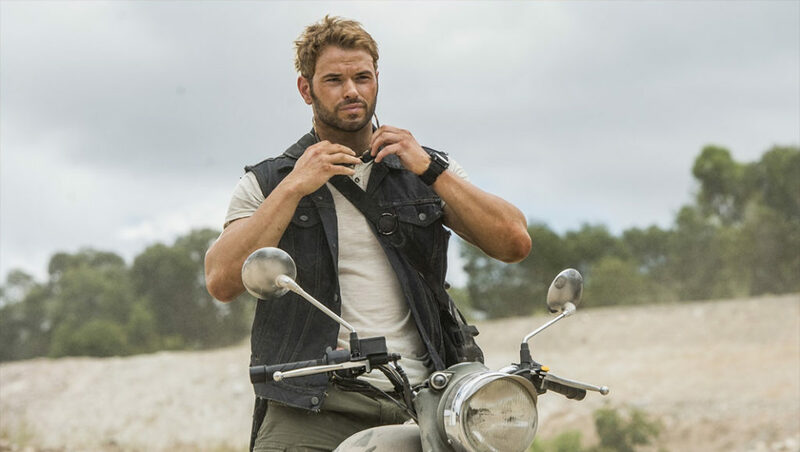 Stepping outside of their comfort zones, in an effort to not only support their colleagues but also reinvent themselves, is a powerful theme in the new action film, ‘7 Guardians of the Tomb.’ Kellan Lutz, who’s best known for playing vampire Emmett Cullen in the ‘Twilight’ film franchise, is doing just that with his latest movie, as he not only helps his co-workers, both on-screen and off, but also continues to powerfully revamp his career. Lutz expressed interest in collaborating with co-writer-director Kimble Rendall on ‘7 Guardians of the Tomb’ a year before the script was even ready to be shown to actors. The performer also embraced portraying one of the heroes in the spider-driven adventure film, which further solidified his up-and-coming status as an action star. His continued transformation as an actor can now be seen in theaters, as well as on VOD and Digital HD, as the movie was released today by Gravitas Ventures. ‘7 Guardians of the Tomb’ follows Jia (Li Bingbing), an Australia-based expert in venomous animals, as she’s informed by her deceased parents’ business partner, biotech corporation CEO Mason (Kelsey Grammer), that her brother, Luke (Wu Chun), is missing. Luke went on a mission for Mason to find a medical breakthrough in one of China’s deserts. The duo immediately sets out to find Luke, with the aid of a search and rescue specialist, Jack (Lutz). The team is also helped by several of Mason’s employees, including Chen (Jason Chong), Milly (Stef Dawson) and Gary (Shane Jacobson). After the team sets off for the rescue mission, a flash fire forces them off the road and into an abandoned building. Upon entering the building, they have their first encounter with flesh eating spiders, which Jia discovers are believed to be only found in Australia. She then realizes that the species were created through an ancient form of genetic engineering, and were infused with extremely deadly venom. So the group decides to seek refuge underground, where they discover a mythical hidden city. Inside the metropolis, the spiders protect a well-preserved mummified Emperor from 200 BC. His obsession with achieving immortality led to the discovery of an incredibly potent elixir that could extend his life. So Jia and her colleagues must do whatever it takes to save Luke before they’re attacked by the spiders, and they awaken the Emperor. Lutz generously took the time recently to talk about starring in ‘7 Guardians of the Tomb’ during an exclusive phone interview. Among other things, the actor discussed that he was drawn to play Jack in the comedy because he not only enjoys Rendall’s directing style, but he also felt the filmmaker created an interesting concept for a spider movie. Lutz also mentioned that he embraces the experience of performing stunts while shooting action-adventure films like this one, which features a mix of CGI and practical effects. The conversation began with Lutz explaining why he was interested in playing Jack in ‘7 Guardians of the Tomb.’ “I met Kimble about four years ago when he was doing press for his movie, ‘Bait,’ and I really love the guy. He’s super fun, and great to work with. Just seeing how he could make a sharks in a supermarket movie work” made the actor want to work with the writer-director on the action-adventure film.